Since our formation in 1986, Uni-Shop Fitting Ltd have continually built upon our experience and are able to offer all of our customers top quality shop fittings and equipment, with a fast and efficient service which is second to none. 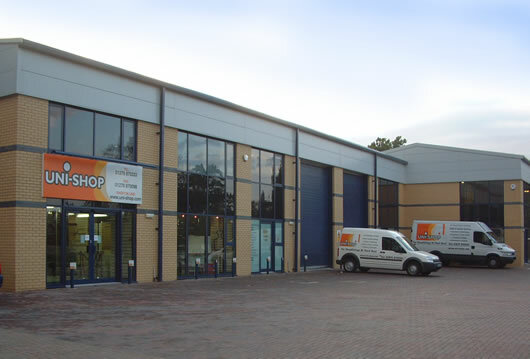 Our large Shopfitting Showroom in Takeley Essex, is just an hour away from Central London. Enabling us to provide a fast Shop Fitting Equipment Service to The Home Counties and East Anglia. Uni-Shop Fittings Ltd is a must visit for many Independent Retailers, Shop Equipment Suppliers, Retail Designers, Shop Fitting Installers, Department Stores and Multiples. As well as to other Shopfitting Suppliers, Shopfitters and Fitting Out Contractors, plus of course for Personal Customers. If you cannot find the equipment which you require, please do not hesitate to contact us, as we know that we will be able to help you. If you already know exactly what you need or have a plan, please send it to us for a competitive quotation. Alternatively, you may visit our showroom and offices where we will show you the range of equipment and help you choose the best layout for your shop. No matter where you are, either on UK mainland or further afield, delivery poses no problem. Most equipment is despatched for mainland deliveries on dedicated vehicles direct from our works or warehouse. For export (we have many clients in mainland Europe, Asia, Africa and even the Falkland Islands! ), we can deliver direct to your packers/shippers or arrange export delivery for you. We are conveniently located a little north of London and just 3 miles from the M11 motorway, we have ample parking and we are outside of the capital's costly Congestion Charging! Our showroom and offices in Takeley, Essex are open Monday to Friday between 8-30am & 5-30pm. If, however, these times are unsuitable, please let us know and we will arrange a more convenient time for you. We are closed on Bank Holidays and you can find our Christmas opening times here. We welcome your call to discuss any of our products. Alternatively you can use our Chat Service at the bottom right hand side of this page.